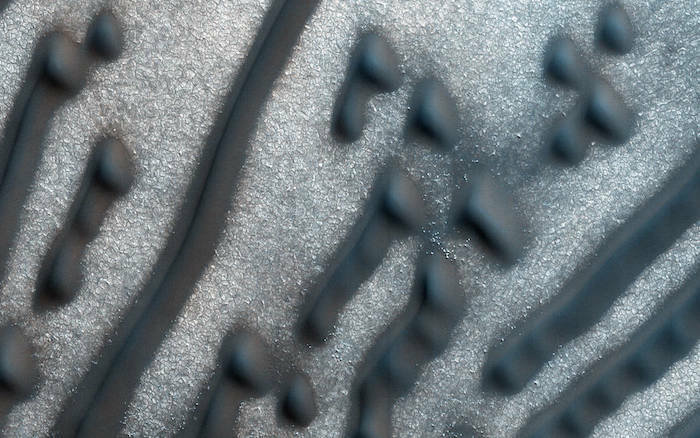 This image of dark dunes on Mars was taken on Feb. 6, 2016, at 15:16 local Mars time by the High Resolution Imaging Science Experiment (HiRISE) camera on NASA's Mars Reconnaissance Orbiter. These dunes are influenced by local topography. The shape and orientation of dunes can usually tell us about wind direction, but in this image, the dune-forms are very complex, so it’s difficult to know the wind direction.